It’s that time of the year again. In 2017, the Super Strong Style 16 was my favorite tournament, beating out the G1 Climax, UK Title Tournament, and the Mae Young Classic. Admittedly, PROGRESS hasn’t been as strong in 2018 as it was in 2017 (when it was my pick for promotion of the year), but the field is loaded and I’m pumped for this event To make it bigger than ever, the three shows take place at Alexandra Palace, where the massive Chapter 55 happened last year. PROGRESS debuted a new ring for this show. Jim Smallman gave a shoutout to the fans who traveled far to come here and put over how great professional wrestling is. 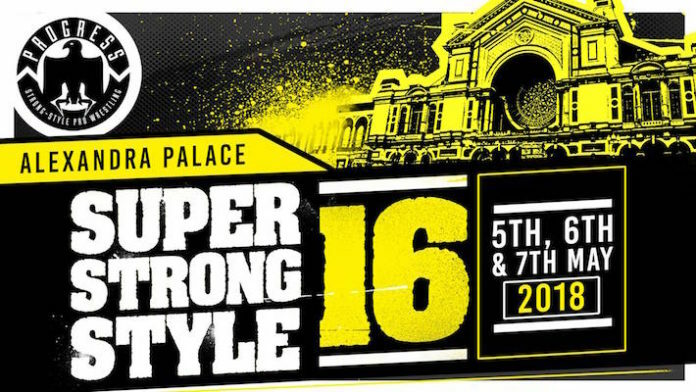 Super Strong Style 16 First Round: Chuck Mambo vs. Zack Sabre Jr. The PROGRESS Tag Team Champions, Grizzled Young Vets, came out as they were apparently sharing a spot in the tournament. The opponent was Joey Janela. Gibson went on a LONG rant, even longer than usual. He bragged about Liverpool getting to the Champion’s League final, before eventually being hit by Joey Janela. They proceeded to brawl all around the arena and onto the stage. Up there, Janela took out Drake with a cannonball, before leaping over the steps and taking out Gibson. It made it to the ring, where Drake was put inside. Gibson declared that they hadn’t decided which member would compete. Drake tried a sneak attack, but Janela was ready with a German suplex. Gibson entered to jump Janela and it was finally official that he would be in the match. Vicky was disappointed and walked off without Flash. Overall: 8/10. Such a fun show. Sure, nothing was must watch or reached four stars, but everything was over three stars. Even the segment involving Grizzled Young Vets was a lot of fun. And, being under three hours, the entire show just moves at a brisk pace and nothing feels long. My kind of event. I suspect the higher quality matches to come on the next two nights.